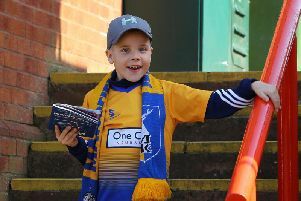 Mansfield Town boss David Flitcroft is happy to see the big clash with title rivals Lincoln City moved to a Monday night for Sky TV and hopes his favourite pundits Jamie Carragher and Gary Neville will be at the One Call Stadium. Stags take on Lincoln on Monday, 18th March and Flitcroft said: “It’s a night game under the floodlights – Monday night football. We might even get Jamie and Gary Neville! I am hoping so. “It’s made it bigger obviously. They want the game because it’s a title race game. “Sky have recognised we’re doing something right and they want to watch ourselves and Lincoln, who are also doing something right down the road, in a local derby. “It’s a brilliant game and we must make sure we get the planning right in terms of the Saturday and Sunday.